Once upon a time 200 years ago, Napoleon and Josephine lived in a house in Paris Rue de la Victoire. It was the only house Napoleon owned as a private citizen. As a landmark, it had a long and colorful history behind it. It was also the scene of several memorable events in the career of this fascinating couple, including one of the earliest encounters between General Bonaparte and Josephine de Beauharnais. Napoleon first visited his future wife here at this location on October 15, 1795, according to historian Maurice Guerrini. 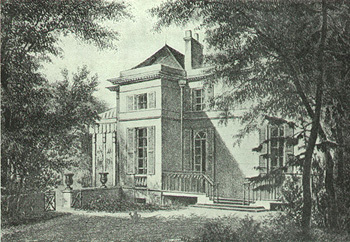 Proctor Patterson Jones, the editor of Napoleon : An Intimate Account of the Years of Supremacy, wrote, he visited this house presumably to congratulate the mother of a young man, Eugene de Beauharnais, who had come to Napoleon to request the sword of his father which had been confiscated during the Revolution. Napoleon was obviously captivated by Eugenes mother, and became a frequent visitor after that first visit. The house was then known as the Hotel de Beauharnais and its street address was No. 6, Rue Chantereine. Interestingly, the street got its name from the frogs that inhabited a marsh nearby. This house later became the scene of several memorable events such as the launching of Napoleons coup detat of the 18th Brumaire in November 9, 1799 and the marriage between his brother Louis and his step-daughter Hortense. In describing what the inside of the house looked like, I will now describe the principal rooms which Napoleon and Josephine used. According to historian Maurice Guerrini, during Napoleons residency, the house consisted of a ground-floor and a first-floor. The ground floor contained an oval dining room which connected to a basement by way of a small stairway. The basement consisted of a cellar, a box-room and a kitchen. This floor also contained a small boudoir decorated with mosaics and a large drawing room lit by tall French-windows leading onto the garden. The drawing room also contained an elegant chimney-piece. Napoleons study, which contained a simple oak desk, was located at the far end of the house facing north On the first floor were Josephines bed and dressing-room, a small boudoir, and Napoleons bedroom. This bedroom was entered by a door carved with Egyptian motifs and was connected to Napoleons ground-floor study by a staircase. The first floor also contained a bathroom, located on the half-landing, and a second attic floor above. The rooms on both floors were hung with mirrors and tapestries. The rooms were always filled with flowers, especially roses from the garden, tastefully arranged by Josephines gifted hands, wrote Guerrini. Josephines garden, measured approximately four yards square and occupied the largest part of the site to which it lent a rural air, according to Guerrini. The house was located in a fashionable and elegant part of Paris called the Chaussee DAntin. According to Maurice Guerrini, writing in his book Napoleon and Paris, financiers and distinguished actors built charming little houses called follies in this area during the 18th Century. The house itself has a curious past behind it. It was built in 1776 by Perrard de Montreuil, the Comte de Provences architect, on marshy land bought from speculator, Bouret de Vezelay. An actress named Louise-Julie Carreau was its first tenant. In March 1780, she took a lease on the house and purchased it for 55,000 francs in December 1781. On August 17, 1795, Carreau leased the house to Josephine de Beauharnais who, in exchange, sold her small apartment at 371, Rue de lUniversite to the great tragic actor Francois Joseph Talma. As the second tenant at No. 6, Rue Chatereine, Josephine made several new improvements to her new home. She turned the terrace of the house into a veranda under a wooden tent which was hung with cotton draperies and decorated with painted or carved flags and pennants. Two months later, Napoleon visited Josephine at her home for the first time. He was impressed with the showy and theatrical decor in which she remodeled her home. In December 1795, she extended the lease to the house from three to nine years. After his marriage to Josephine on March 9, 1796, Napoleon took up residence at No. 6, Rue Chantereine. A few days later, he left to take command of the Army of Italy. On December 28, 1797, as a tribute to Napoleons victory in Italy, the Central Administration of the Department of the Seine decided to give a new name to Rue Chantereine, the street where he lived. It was renamed the Rue de la Victoire. On March 26, 1798, Napoleon purchased the house on the Rue de la Victoire, also known as the Hotel Bonaparte, from the lessor for 52,400 livres. The lessor was none-other-than the actress Louise-Julie Carreau, the very first tenant of the property. Carreau was now married to the noted tragic actor and Napoleons friend, Talma. The houses address was renumbered No. 60, Rue de la Victoire. Now that the house belonged to Napoleon, it would be fitting to mention how long, he actually lived in the house. According to Guerrini, he lived here between December 5, 1797, the date of his return from Italy and May 3, 1798, the day he left for Egypt. After his return from Egypt on October 16,1799, he lived here for a time until November 14 of the same year when as First Consul he took up residence with Josephine at the Petit Luxembourg Palace. Toward the end of the Consulate, the property was remodeled and added to by buying up some surrounding real estate. In May, 1803, a parcel of land of some twenty square yards was purchased which represented the porters lodge the property of the Marquis de Saint-Chamans. In May 1804, the propertys garden was extended eastwards by parcels of land of a thousand square yards. In July 1806, Napoleon gave his former home on the Rue de la Victoire as a dowry to his cousin Marie-Louise-Stephanie-Rolier Benielli. Benielli married Colonel Charles Lefebvre-Desnouettes, Napoleons Master of the Horse. After the restoration of the Bourbon monarchy in 1815, Madame Lefebvre sold the house and was exiled with her husband to the United States. After returning from exile, Madame Lefebvre once again recovered the house on August 13, 1823 and kept the property for over thirty-five years. Guerrini wrpte that In 1830 and in 1837, she bought further parcels of land to enlarge her garden and to make an exit on the Rue Saint Lazare, where she bought a house and garden. In 1857, a banker named Joseph Goubie acquired the property and paid over a half million francs to Madame Charles Lefebvre. This sale paved the way for the demolition of the house that served as the haven of Napoleon and Josephine. The house was demolished in 1858 as part of the town-planning and road-works program during the Second Empire of Napoleon III. Although Napoleon lived in it for only a short time, the house on the Rue de la Victoire played an important role in the life of this great man and his first wife. Jones, Proctor Patterson. Napoleon : An Intimate Account of the Years of Supremacy (1800-1814) New York : Random House;1992. Guerrini, Maurice. Napoleon and Paris: Thirty Years of History New York : Walker and Company; 1970.